Everyone knows Jackie Chan. Whether it’s from Rush Hour, Shanghai Noon, The Karate Kid, or Kung Fu Panda, Jackie is admired by generations of moviegoers for his acrobatic fighting style, comic timing, and mind-bending stunts. In 2016 - after 56 years in the industry, over 200 films, and many broken bones - he received an honorary Academy Award for his lifetime achievement in film. But at 64 years old, Jackie is just getting started. Jackie has never shied away from his mistakes. Since The Young Master in 1980, Jackie’s films have ended with a bloopers reel in which he stumbles over his lines, misses his mark, or crashes to the ground in a stunt gone south. In Never Grow Up, Jackie applies the same spirit of openness to his life, proving time and time again why he’s beloved the world over: He’s honest, funny, kind, brave beyond reckoning and - after all this time - still young at heart. book! I really enjoyed it! I want to highly recommend ot to everyone! Daxing Zhang narrates with a heavy accent which detracted from the story. I would have preferred to have Jackie Chan narrate his own story. Since he choose not to, why not use another Asian voice narrator who spoke clearly and concisely? The female narrator was excellent and they should had her narrate the entire book or chosen another male narrator. 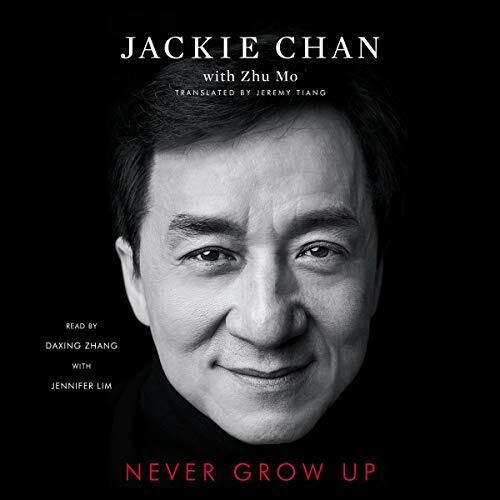 Never grow up is a more off-the-cuff telling of Jackie Chan's life, compared with his early autobiography which was sleekly mined and organized by a ghost writer. This book reads like Jackie just talking about stuff which can be really refreshing, and also a bit heartbreaking. Jackie leaves little off the table here. While the media focuses exclusively on the ugly (and boy, is there a lot of ugly) there is also a tremendous amount of beauty to be found in the human being of Jackie Chan. If his mission in writing this was to transmit an impression of himself as an honest and flawed, ordinary human being who has had the benefit of an extraordinary life, this book wildly succeeds at that. ...And the Oscar goes to... Vulnerability! I’ve listened to many memoirs. This one takes the cake! Initially I thought this memoir was a bunch of boloney. But Jackie Chan came thru. To be honest, I’ve only watched two of his movies; ‘Shanghai Nights’ and noon. I had absolutely no idea what his back story was. Don’t think twice about getting this book. It’s amazing! there is so much in this book that I never realized about Jackie. very good read. I loved it. i found relatable life lessons and it's refreshing to see an autobiography where the individual displays and admits their flaws as much as their strengths. Jackie does well in showing his humanity and though not him, the narrator does well in relaying his sentiment in a simple but believable fashion. I thought I knew a lot about Jackie as I have been a huge fan of his since the 90's. This book was amazing! I learned so much more about the journey he took... the many mistakes he made and the lessons it took a lifetime to learn. I laughed and cried while listening to this book and feel like I now know him. This truly is an intimate look into his life like we have never had before. A must read/listen to for any fan. Jackie Chan reveals his story, his world, and so much kindness. His reflection on life thus far was wonderful. Once you start you'll have to finish. I listened to the audio and finished in one day. I am grateful to been able to get to know him through this. Definitely changed my perspective of him as a star to just another ambitious hard working person that has a lot of love to give. I’ve learned a lot and am grateful for the lessons, and perspectives he shares. Thank you to everyone that helped in the making. I don’t read at all but I finished this in 4 days lol so that says ALOT. Thanks audible. Would have liked more detail on his movies with Owen Wilson but good story nonetheless.